AMERICAN WELDQUIP offers you a No-Nonsense/Cost-Effective tool-center maintenance package for robotic MIG welding. Our air-cooled and water-cooled Robotic MIG torches offer unsurpassed performance not found in competitive brands. 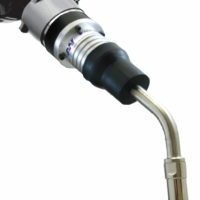 High quality materials and workmanship go into each AMERICAN WELDQUIP torch. Unique design features incorporated into our robotic torch system mean fewer repairs, lower maintenance costs and less downtime to insure a lower cost of ownership. Choose from our large selection of standard air or water-cooled, robotic MIG welding packages or let us design a system based on your unique requirements. If you do not see a standard configuration you need – no problem. Contact us with your special requirements and we will design and manufacture a torch to your exact specifications. Custom designed torches normally can be completed and shipped to you in a matter of days! The rugged gooseneck design effectively dissipates heat by providing a continuous metal to metal path from the nozzle to the front of the handle. In the case of the air-cooled torch the entire length of the outer jacket functions as a radiator pulling the heat from the front end consumables. All American Weldquip water-cooled goosenecks are designed for superior heat dissipation. The heavy-walled outer tube gives additional strength to stand up in rugged environments. There are no o-rings to leak and all water passage joints are silver soldered and 100% quality tested for leaks. The unique designs of the gooseneck, nozzle, diffuser, and contact tip function as a team to keep the front end consumables running cooler to insure longer life. Our unique precision machined locating flat between the torch body/mount and the gooseneck provide accurate and repeatable TCP alignment when changing out goosenecks or torch assemblies. No keys or pins to come loose or fall out. FLAT OUT THE BEST design to guarantee you repetitive TCP placement. The heavy walled, nickel plated nozzles thread directly on the gooseneck to provide cooler operation and a longer lasting nozzle system. The course thread, fixed position design feature insures a constant tip to nozzles relationship and consistent welding parameters. Heavy-duty, course threaded contact tips are designed to provide excellent arc start characteristics, extended life and insure a superior electrical connection to the tip holder/diffuser. Get extended life with our special material HRT - HEAT RESISANT TECHNOLOGY contact tip. Most of our torches are designed to utilize the same consumables to help reduce your inventory. Manufactured to exacting specifications, our air-cooled power cable assembly is made from cut resistant, burn resistant, lightweight materials. The power cable features heavy duty factory crimped cable end fittings to insure a secure, positive electrical connection, producing less electrical resistance and less heat. ALL American Weldquip power cables incorporate a HYTREL® core tube. This core tube material offers superior kinking and impact resistance for smoother feedability and improved gas flow. In addition, the cable assembly is more durable if stepped on or crushed. Our unique water-cooled system eliminates the high failure and maintenance associated with conventional water-cooled power cable systems. Our exclusive "HYBRID" design utilizes a water-cooled gooseneck combined with an air-cooled power cable. You experience the benefits of the rugged air-cooled design with the higher amperage performance of water-cooled. Plus, if water-cooling of the torch is interrupted the worse case is you get the performance of an air-cooled torch with no damage to the torch or cable system. Available in a variety of sizes and configurations to fit every wire type application. Our ArcSafe Advantage and Quick Change Solid Mount Robotic Systems offer a front loading gooseneck liner. Most torch assemblies incorporate a heavy duty but flexible spring cable support at both the front handle and wire feeder end of the cable assembly. This feature helps prevent feedability problems in extreme bending applications and relieve cable strain which results in increased power cable life. Available options include air-blast, voltage sensing, nozzle touch sensing, replaceable nozzle seats and other customer special design requirements. Our combination of a heavy-duty torch design with a unique positioning flat, solid torch mount and the ArcSafeTM for collision protection provide a highly accurate, repeatable and low maintenance robotic package for precision welding and maximum productivity. Air-Cooled Models – 300 and 500 Amp Versions. Water-Cooled Models – 450, 550 and 600 Amp Versions. The American Weldquip ArcSafe Advantage Series Robotic System is designed and engineered for the latest generation “Thru Arm” type welding robots. Standard features includes a modular concept in which all configurations(air and water-cooled) utilize the same platform to build from. The electrical rotary joint is common to all robotic systems and is easily adaptable to all multiple brand name robots. Updating or changing system requirements is as easy as adding the necessary components. The advantage system offers 360 degrees of unlimited, continuous rotation with no power cable twisting or torsional strain to substantially increase cable life. Water-Cooled Models – 550 Amp Version.